You know you need this workout. It’s time to burn some fat and get fit in the process but you have no equipment and you want a quick workout that can be done at home and fast. Today’s workout is an at home cardio workout that requires absolutely no equipment and promises to burn some serious fat as it kicks your metabolism up into overdrive over the coming days. This is a bodyweight HIIT that my clients sometimes do as warm up making it perfect for beginners as a main cardio workout. In fact it’s great if you are very new to exercise, recovering from an injury, overweight and struggle with traditional HIIT workouts or you are just quite unfit at the moment. We love High Intensity Interval Training so much, mostly because it can be done anywhere and you get fast results, both in terms of your fitness and more importantly fat loss. Doing a body weight HIIT yields similar if not better results as traditional cardio workouts would. The workouts are fast, with little rest and is more like interval training, which we all know is one of the best forms of training for fast results. 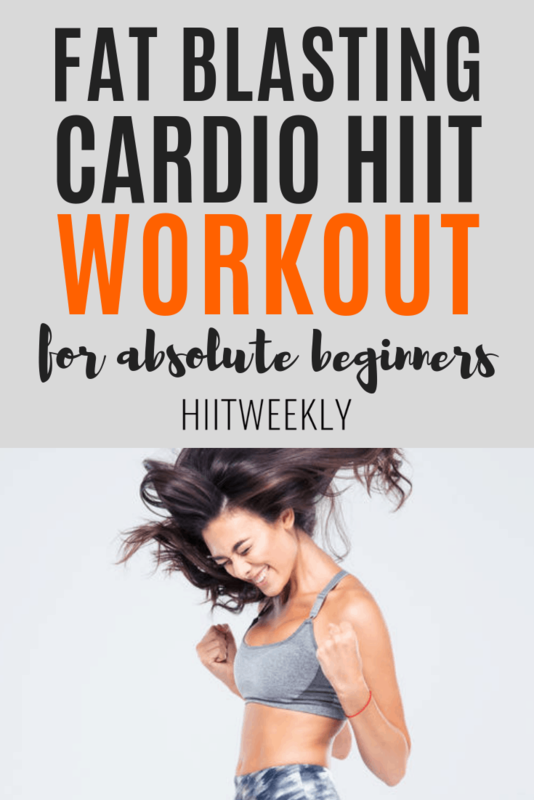 If you are new to HIIT or you’re looking for something to add to your weighted HIIT sessions then you’ll love this cardio workout. We have targeted the workout at absolute beginners so bare with us as it is quite different from our usual HIIT workouts. Hopefully it will prepare you for some of our more intense workouts we have here at HIIT Weekly. Beginners, do this workout 3 days a week until you can do it with ease and then try some of our more advanced cardio HIIT workouts. This workout is going to be quite hard if you are a beginner and we’ve added a few simplified alternatives if you struggle with the exercises. To make this workout harder start by cutting the rest time in half and gradually reducing it until you get to no rest whatsoever. At this point you would have knocked off 90 seconds from each round so why not try adding a 5th or 6th round. Once you have mastered the beginner exercises advance onto the harder ones. High knees are a tough exercise to do and are excellent for your abs but they are difficult. If you cannot do high knees as outlined in the video below simply march on the spot as fast as you can. You could even start with running high knees and then march once you can’t run anymore. It’s about working at your level of fitness and building on it over time. Aim to do a squat jump but if that’s too much or isn’t physically possible right now start off with bodyweight squats. Get a slow as you can without rounding your back. You could progress the squats by extending up onto your toes at the top of the squat as you stand. The more dynamic movement is the plank jacks that work the core, legs and shoulders but the toe taps are just as effective if that’s all you can do. HIIT is about working to YOUR maximal effort while raising your heart rate. If you can do a full Burpee that’s great but if there’s a chance that you can’t or they make you go too dizzy then try the beginner version. The stepping burpee is a low impact alternative that will still raise your heart rate and get your entire body working. If it’s too difficult to get down to the floor try using a box, chair or step to place your hands on to do raised burpees. When it’s time to progress try a traditional burpee but place your hands on something raised like a chair. 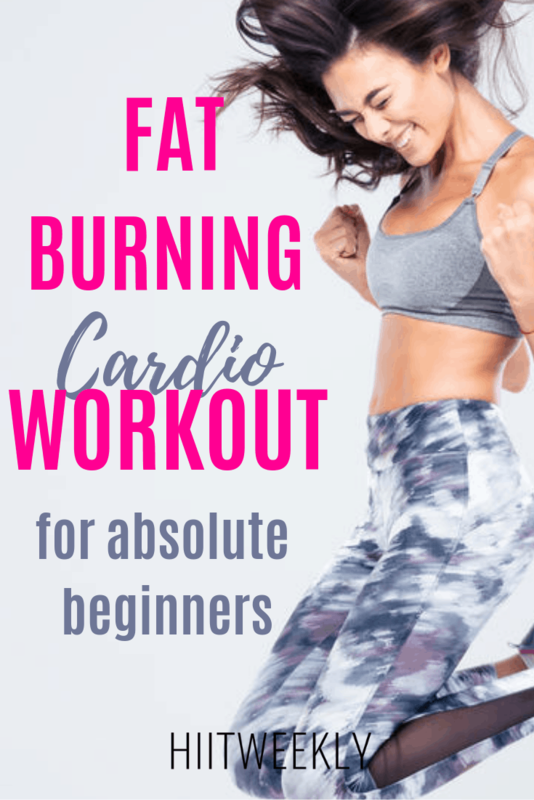 There you have it, a cardio HIIT workout for absolute beginners that can be scaled for a more intense workout that can be done anywhere.